Mazerine broadcloth was advertised in 18th century newspapers. It is a bright or what many modern people might call royal blue. Blue was a very common color for wool throughout the 18th and 19th centuries. This wool coating could be used to make a man's coat, greatcoat, waistcoat, breeches or jacket. It could also be used for a woman's cloak. For example from personal communication with Mike Barbieri in the 1777 Connecticut Journal an ad included, "RUN away . . . an apprentice Boy . . . had with him, one blue broad cloth Coat, newly turnâ€™d, trimâ€™d with blue Lining and white buttons". None of our threads really match this shade of blue so you could sew with unbleached linen thread or use medium blue linen thread realizing it wont match well. 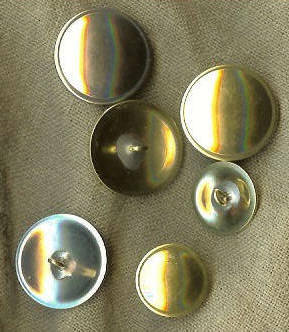 For hand sewing button holes the best bet may not to match at all by using natural quilter's thread or buttonhole twist.